We're off to a great start here at Cranmore for vacation week. We received over two feet of snow in the last 2-3 weeks and last Monday was one of the best powder days I have personally experienced here or anywhere, East or West. Because of the snowfall we were able to open some of our new terrain which relies on natural snow. I checked out Gibson Chutes and greatly enjoyed the steeper narrow trails through the woods off the Gibson trail, down to the new Tommy's Trail. Snowboarders be forewarned - Tommy's is a traverse so be prepared to unstrap and walk portions of it, including the short uphill bit at the very end before it reenters Beginner's Luck. Still, the three snowboarders who passed me on the Chutes thought it was worth it to snag all that fresh powder in the woods. I also did my first glade runs of the year in old favorites like Treemeister and Beech glades. Mother nature decided it was time for loose granular conditions but thanks to the deep base from her and our snowmakers, we still have excellent coverage even after some less than snowy precipitation. New Year's Eve ticket sales have been brisk and we anticipate selling out over this weekend, if not before (only about 17 were left as I type this Fri. afternoon). But never fear, we will have PLENTY of room for anyone who wants to come skiing, riding, tubing or to view fireworks or the bonfire. But the lucky coupla-hundred folks who bought their tickets in advance will have VIP access to the Chris Fitz Band show in the Eating House. The rest of you can enjoy listening to live music in the main base lodge set up with its own beer & wine bar on the 3rd floor - a great vantage point to enjoy the fireworks. Sit on the upper deck with a Sunset Wheat beer and watch the fireworks over the ski slopes at midnight - does it get any better than that? All I want for Christmas is a weather forecast showing storm after storm heading into the White Mountains. For once, I am getting my Christmas wish. We enjoyed 5" of the fluffy stuff yesterday, giving me my first powder run of the year, hopefully the first of many. Another 2-3" is coming in Friday, just in time for the weekend. Then a real "nor'easter" for Sunday. And if you believe long term forecasts, Christmas week could see another bout of snow before the holiday. What a gift for us snow lovers! Now Jimmy, our mountain manager, loves to "under promise and over deliver," which of course makes him the antithesis of most of us in the marketing trade. ;) He is going to check his weather prognosticator and get back to me with an update on the forecast, but I think any way you spell it, we are going to have a very white Christmas indeed. Jimmy also told me we are going to open new terrain for this weekend, including Skimeister, Split Decision, expanding Schneider all the way down to Gibson, and both the Competition Slope and Middle will now be open down to the North which runs down to the Quad. This on top of already having Artist Falls and Easy Street off the Summit means we will have the best variety of terrain going in very short order here! Not only does it show you what trails are opened, closed, groomed and where snow was made, it also gives you little insider tips and descriptions of each trail from yours truly. We are in the process of uploading videos and still photos of every trail and left. But here's what's REALLY cool. You, our loyal fans, can also submit photos and videos. Click on the "submit my photo/video" tab at the top of the map and if we like it, we'll post it! My goal is to have this trail map lit up like a Christmas tree by the first of the year so thanks in advance for helping me reach that goal. See you on the slopes this weekend I hope! What a great way to reward yourself for finishing your holiday shopping early (yeah right!). No doubt if you live in Mass. or NH you are aware that we had a bout with the "r" word here in northern NH last night. Well, the good news is that there is still plenty of the white stuff on the ground and we still anticipate opening additional terrain this weekend. And colder temps are returning tonight, which means that snowmaking can resume and the snow will set up nicely, allowing us to groom again overnight and into tomorrow, Saturday. Our snow surfaces team faces challenges such as these with a reassuring nonchallence. I look out my window at the wet snow and wonder how the rain of today will affect my skiing tomorrow. But our snow groomers look at that same wet stuff and see both a challenge and an opportunity to restore the slopes to their previously wonderous conditions. By not grooming today, Friday, it actually kept the wet snow from getting packed down or damaged by the grooming equipment. And after a cold night tonight, we can once again till the surface for skiing and riding on Sat. This is my seventh winter here at Cranmore and there is not a day that goes by that I don't learn more about the art and science that is snowmaking and grooming. No wonder our Mountain Ops Director Jimmy Mersereau was selected to be part of the snow grooming team at the Salt Lake City Olympics. The Olympic committe surely knows talent when they see it. In the meantime, check out our new photo gallery page, featuring our daily picture, weekly video snow report and live cam shots to see that we do indeed still have plenty 'o snow left here. Great news - Cranmore is now open for its 71st season and is off to a great start. We have 9 trails today, Sat. with more coming very soon. Conditions are surprisingly good. Last winter's fabulous snow fall is still in my memory and the start to this year promises more of the same. I went out and filmed our weekly video snow report this morning with our entire snowboarding instruction crew, which you will see posted very soon. It's a cold bluebird day and snow surfaces are a crisp packed powder. It's a great day to get those first turns in. Best of all, the weather is calling for a few inches of snow Sunday night which can only make things even sweeter! Well, another surprise snowfall this morning - a few wet inches of snow greeted me when I got up this morning. Word on the mountain that the wet stuff makes for a GREAT base so we continue to be in great shape for opening this weekend. Snowmaking temps return later this week and come Saturday, there will be ideal conditions to crank out the white stuff. Of course, everything is weather dependent so check back to our snow report or call our snow phone before coming over. So the countdown is on. So far so good. Tubing was a big hit last weekend as was our new indoor fun zone. Hope you all come out to greet the new winter season at Cranmore this Saturday! We'll have special $42 lift tickets for adults and teens, $31 for kids 6-12 and under 5 free as always. What a happy surprise it was to wake up this morning and find my backyard covered in several inches of the white stuff. I love it when the weatherman gets it all wrong. This surprise snowfall was definitely not in the forecast which called for a chance of some light snow mixed in overnight before turning over to all rain. Instead we have plowable snow. As I sit here in my office at the base of Cranmore, pretty close to the lunch hour, the snow is still coming down at a good clip. At least 4" have fallen already and more is to come. Sure, it may switch over to the "r" word later on but for now - it's a sight for sore eyes. Nothing covers up the dismal browns of November like a fresh coating of the white stuff. This plus the work of our snowmakers ensures our tubing park will be in great shape for Fri. Nov. 28th, that plus our jib park up by the Lucky Loop lift. And opening weekend Dec. 6th should be awesome. I hear from Jimmy Mersereau, our head of Mountain Ops, that there is an excellent chance that we will be skiing and riding off the summit right from Day 1. Plan is to open Artist Falls, South Slope, Beginners Basin and Beginner's Luck. That is preliminary - if Mother Nature surprises us again like she did today, who knows what we can pull off. Of course, everything is weather permitting so check back here or call our snow phone if you are on the road for the latest - 1-800-SUN-N-SKI. When you're done tubing or hitting the rails, be sure to check out our new indoor Fun Zone opening this Fri. and Sat. from 4-7pm at the Fitness Center. When was the last time you played Dodge Ball or bounced in a Bouncy House? Yeah, I thought so. Check it out - only $10 and it will help you burn off all that turkey. Our snow making team has been working in overdrive for a week now. Thanks to their efforts, we predict opening with top to bottom skiing off the summit on Sat. Dec. 6. Plan is to open from Artist Falls. Other trails to open: South Slope and Beginner's Luck. Stay tuned - this is just a preliminary forecast. The tubing park will be in good shape for Fri. 11/28 as is the Lucky Loop terrain park, which will be open for "hike up" service to the surface lift adjacent to the park. As always, check out the live web cams and photo of the day - a picture is worth a thousand words. See you on the slopes very very soon! It is amazing what our snow makers can do with just a few days of cold weather. We fired up the snow guns again on Tues. when cold weather returned. And now just a few days later, it is beginning to look at LOT like Christmas on trails like the South, Beginner's Luck, the Darkside plus the lower tubing park and the base area by the Quad. I watched the local weather report this morning and low temps are continuing in the TEENS right through early next week, so I can only imagine what those snow makers are going to accomplish. Now everything is weather dependent, but if I were a betting woman (and I am), then I would say things are looking pretty darn good for that planned opening on 11/28 for tubing and the jib park on Beginner's Luck. Stay tuned, check out the snow report or call the snow phone 603-356-5544 for details. But if I were you, I'd be breaking out the snow pants and dusting off the skis and snowboards to hit the jibs in the park or go for a slide in the tubing park to overcome turkey coma next week. The temperature was noticeably colder this evening when I left the office than it had been just a short time earlier. The warmer temps of the weekend are clearly falling behind us and snow making weather is back. I talked with our snow making team today and they are still bullilsh for a Thanksgiving weekend opening for the tubing park and a jib park on Beginner's Luck. So far we have made snow on the South Slope, Beginner's Luck, lower tubing park and at the top of the Darkside Terrain Park. The rain this weekend definitely didn't help but it was a good first blast of snow to "blow the mice out" (as we like to say) and test the lines. Everything is in working order and ready to go again starting this week for real. I write this as we are preparing for the Boston Snowsports Expo. It's always fun to talk to our fans who have been dying to get back on skis at Cranmore. I hope you will stop by our booth to say hello. We'll be there Thurs. 11/20 - Sun. 11/23. We'll have show specials on season passes and some ski and stay deals so stop by and maybe you'll save some dough. Oh, and be sure to ask for your free lift ticket valid for Fri. Jan. 9th. We'll be handing out hundreds of these free tickets during the show. C-more the Penguin will also be at the booth on Sat. & Sun., serving s'mores for the kids. Free lift tickets and s'mores - what more could you ask for to get in the mood for skiing at Cranmore? Hope to see you there! This morning, little snowflakes were falling as I drove to work. Last year, we began snowmaking on Nov. 11th and here at Cranmore, our snowmakers are at the ready, preparing to blow the white stuff as soon as weather permits. Jimmy tells me it's going to be warm through this weekend but we are looking at the long-range forecast and seeing temps in the teens at night starting early next week. Then watch out! 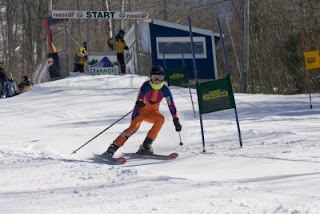 In the meantime, a sure sign of winter is upon us tomorrow night, as Mountain Meisters kicks off the season with its annual Captain's Meeting, Wed. Nov. 12 at the Eating House at Cranmore at 6pm. Team captains, or those wanting to learn more about the largest recreational race league in the country, are welcome to come to hear about this winter's Meister races. When I first came to Cranmore over 6 years ago, I wondered why everyone was so psyched about Meisters. Especially for my own purposes. I'd never raced gates or worn a GS Suit (everyone can be thankful for that). In fact, it took me 5 winters here before I joined a Meisters team. I snow plowed around the gates week after week, like many of my fellow Meisters. But it's not all about race times, although there are certainly some excellent and serious racers in the ranks. Meister races are on Wednesdays, when the many local retail, hospitality and ski area employees have time off from their jobs. Not only is it a great excuse to ski at least once every week, it's also a not to miss social scene. If you're a local, I hope you'll consider joining a Meister Team this year. It is very affordable and it will make you a better skier and a better racer; plus you'll have an excuse to hang out with all your friends every Wednesday afternoon. If you're not a local but are in town on a random Wednesday this winter, stop by Zip's Pub and take in the Apres Scene. It is one you just will not find on a typical weekend here. Apres ski like a local! It's fun! Welcome to this, the first blog entry for Cranmore Mountain! This has been an exciting week at Cranmore, as we launched our new winter website. That and we had snow flurries last week, snow is on the top of Mount Washington and snow flakes are showing up in the weather report for next week! I wanted to share with you everything new you can expect at Cranmore this winter. First off, we have added new trails and glades for this winter. Be sure to check out Gibson Chutes a "natural skiing area" off of the Gibson Trial. With all the snowfall last winter, our guests spent some time in the woods here, so we went in this summer and did some clearing and grading of this area. We also are opening Tommy's Trail, which is a portion of the access road to the summit but now is a real ski trail, accessed from the bottom of the East and running to Beginner's Luck. Finally, Roundabout is a killer little intermediate trail added off Snow Train. I took a group fitness class out of our CFFC for a run down it the other afternoon. It is windy, narrow and steep. Can't wait to see what it looks like with snow on it! We anticipate opening for tubing for Thanksgiving Weekend, Fri. & Sat. 11/28 - 11/29 and might even set up a little rail park on Beginner's Luck as we have done in year's past. Skiing and riding and full mountain operations are slated to open Dec. 6. Of course, we need ol' Mother Nature to cooperate. It's been chilly, the squirrel's tails are bushy, the woolly caterpillars are woolly-er than ever and the Old Farmer's Almanac is promising a cold and snowy winter in these parts. I still have photos of the 4 foot snow banks by my house last April. Let's hope this year is as spectacular as last. In other news, we are opening a new Fun Zone indoors at Cranmore. It will operate Saturday and vacation period evenings out of the Cranmore Fitness Center. It features a giant obstacle course, bouncy house, dodge ball, tennis, floor hockey and other fun and games. Tickets are $10 or buy them online in advance for $8. That's about it for now. We'll all busy putting the finishing touches around the resort, getting ready for what promises to be another great season of skiing and riding at Cranmore Mountain. I will be updating this blog frequently throughout the season so check back often! It will be your best source for the inside scoop on what's up at Cranmore.